The Cabinet on Thursday allowed composite foreign investment caps, merging those on foreign direct investment and portfolio investment. The move will benefit companies in single-brand retail, credit information business and commodity and power exchanges; it isn’t applicable to banks and defence companies. Bankers, however, claimed they would benefit from the move, leading to confusion on the matter. 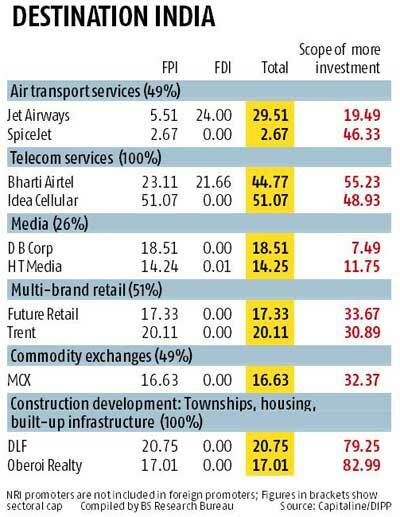 Besides, a clause in the proposal, mooted by the Department of Industrial Policy and Promotion (DIPP) — portfolio investment up to an aggregate of 49 per cent be allowed without being subject to government approval and sectoral norms — has resulted in various interpretations, with some experts saying foreign portfolio investment (FPI) of up to 49 per cent could be allowed in the print media. Foreign investment of up to 100 per cent through the automatic route is already allowed in a vast majority of sectors. However, a board resolution would still be needed from the company concerned to increase FPI beyond 24 per cent, but that level could now be increased to the sectoral caps. “Currently, companies require board resolution to increase FII limits beyond 24 per cent. It seems a resolution will still be required to increase it beyond 24 per cent. But now, it could be increased till the sectoral limit, against a separate FPI limit, as is the case in some sectors now,” said Punit Shah of Dhruva Advisors LLP. Earlier in the day, the Cabinet announcement had evoked positive response from lenders, with YES Bank saying it had already secured board approval for increasing the FPI limit up to 74 per cent, as well as an enabling nod from shareholders for this. Banking stocks rose following the Cabinet announcement: Axis Bank was up 4.14 per cent on the BSE, followed by Kotak Mahindra Bank (4.03 per cent), YES Bank (3.11 per cent), HDFC Bank (1.54 per cent), State Bank of India (1.29 per cent) and ICICI Bank (0.83 per cent). However, later in the day, the DIPP and finance ministry officials clarified the composite caps wouldn’t be applicable to the defence and banking sectors --- the FPI cap would remain at 24 per cent in defence and 49 per cent in private sector banks. Currently, foreign investment of up to 49 per cent is allowed in defence and 74 per cent in private banks. Subject to certain conditions, foreign investment may exceed 49 per cent in defence, with the approval of the Cabinet Committee on Security. Besides FDI and FPI, investment by NRIs, foreign venture capital investors, limited liability partnerships and those in the form of depository receipts would qualify as foreign investment. In sectors with composite caps, the existing condition of seeking the FIPB’s approval would hold. For instance, in single-brand retail, foreign investment beyond 49 per cent will still require an FIPB approval. That might increase greater scrutiny of FPI money in some cases, a DIPP official said. Punit Shah said there would be greater scrutiny of FPI inflows beyond the automatic route in sectors with both automatic and approval routes. Thursday’s Cabinet decision, it would appear, will make it difficult for the Securities and Exchange Board of India to monitor FPI investments. However, Shah said it would be possible to monitor FPI investments, as these would continue to be separate from foreign direct investment, though the limits would be merged. The Cabinet decision will allow FPI investment up to an aggregate of 49 per cent without the government’s approval or compliance with sectoral conditions if such investments do not result in transfer of ownership or control of Indian entities from resident Indians to non-resident ones. This, too, is a grey area. “FDI of up to 26 per cent is permitted in the print media, with government approval. 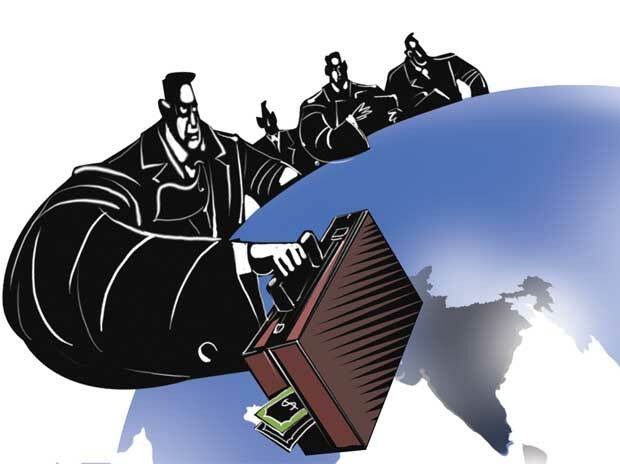 After the change, portfolio investment of up to 49 per cent is permitted without government approval, if there is no change in control with a resident Indian citizen,” said Mehul Modi, senior director, Deloitte in India. He added there was need for more clarity in this regard. Currently, up to 26 per cent FDI is allowed in print media engaged in news and current affairs and in Indian editions of foreign magazines dealing with news and current affairs, with government approval.